Dr. Zee describes his dreams which reveal the fate of Starbuck and his link to the lost pilot. Jamie Hamilton: Don't bother me, I'm praying. Q: so what happens to starbuck in the final episode? A truly awful series and not at all like the original. The worst series in the world....ever! 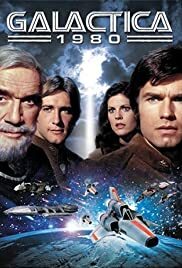 After the events of the REAL Battlestar Galactica and series, this troll of a series came along. Gone are Starbuck and Apollo and replacing them are Troy and Dillon. Wannabee heroes who can't act. They might as well have cast Troi (StarTrek TNG) and Dillan (Magic Roundabout) for all the effectiveness they have. Lorne Greene must have had a mortgage to pay off or something, because I can't see any other reason he'd want to be on board this turkey. There's a new character, in the form of the obnoxious Dr Zee. A child genius who basically tells Adama what to do. I couldn't help thinking that maybe Adama had gone senile and Zee was his nurse - he always dressed in white, anyhow. It certainly seemed like Adama was senile, he didn't seem to be able to make a decision without consulting the boy-wonder. A far cry from the confident, decisive war veteran of the original Galactica series. Anyway Troy and Dillon get to inact it up a little and go to Earth on repetitive boring missions. There's none of the interesting space-going malarkey from the original series (even though a lot of it was stock footage) and I don't think I ever saw a starfighter. No budget for anything remotely interesting. The only gadgets on display were the flying motorcycles (I kid you not) that the heroes use now and again. The special effects of them flying through the air are particularly guffawful, reminding me of those old rear-window shots of roads in black and white films, where the road movements in the background bore no correlation to what the driver did with the wheel. A truly awful series and not at all like the original. Only one episode is remotely worth watching. Entitled "The Return of Starbuck" it focuses on what happened to Starbuck and has a kind of "Enemy Mine" plot involving a Cylon. Mercifully, it features only very few scenes of Dr Zee and Adama talking and none at all of Troy and Dufus. Nearly all Starbuck. But, apart from this one episode, the rest of the series is just awful.